ADVANCED ANTI-THEFT PROTECTION featured on all Vaultek safes includes anti-pry bars, Dual anti-impact latches, interior mounted hinges and NEW IMPACT DETECTION exclusive to PRO SERIES for the ultimate prevention against break-ins. 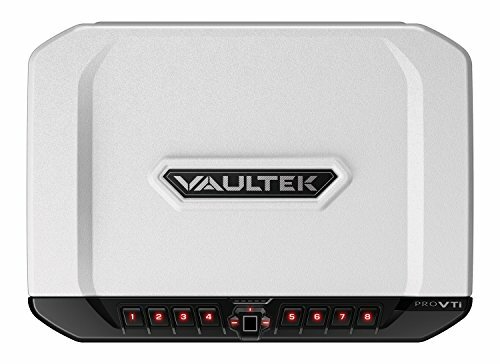 Introducing the all new PRO VTi, the latest addition to Vaultek’s RUGGED line of SMART SAFES. Pro Series is designed for the enthusiast gun owner and builds on signature features you’ve come to know and love from VaultekTM safes. NEW FEATURES include a revised PRECISION ENGINEERED unibody design with 12-gauge steel capable of housing multiple handguns. PADDED INTERIOR uses non-absorbent CLOSED CELL FOAM to preserve firearm conditioning. Pro Series safes also come equipped with the fastest access point available, SMART KEY. Another feature exclusive to Pro Series is IMPACT DETECTION. Standard features available with all VaultekTM safes include secure anchoring. Use the supplied mounting hardware or 4 foot long HEAVY-DUTY 5MM DIAMETER STEEL SECURITY CABLE. Anti-pry bars prevent tools from breaking in. Interior hinges can not be breached from the outside. Dual anti-impact latches resist impacts. VaultekTM is on mission to keep your belongings secure. Integrated SMART TECHNOLOGY raises personal security to a new level with an UPGRADED high-resolution biometric FINGERPRINT SCANNER storing up to 20 different user IDs. Remotely access the safe using the APP 2.0 from your smartphone to check power levels, view safe history, detect tampering, and customize your safe preferences. A built-in ADJUSTABLE INTERIOR LED LIGHT provides high visibility of your items. The backlit keypad illuminates via proximity sensor making it easy to navigate at night and features several hot key entries including toggling the Bluetooth on/off. Long lasting RECHARGEABLE LITHIUM-ION battery keeps you powered for months, and only needs 2.5 hours to recharge with the included micro-USB charging kit. Makes a great gift for shooters looking to keep their firearms preserved, protected, and out of the wrong hands. Meets TSA airline firearm guidelines. Interior Dimensions 13.7″ x 6.5″ x 2.75″. Exterior Dimensions 14.5″ x 10.6″ x 3.3″. U.S. PATENT PENDING.